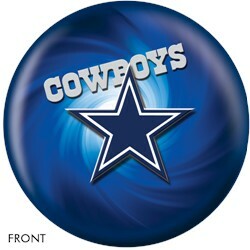 Dallas Cowboys fans get ready to bowl on any lane condition with this ball! This is another way to represent your favorite team and show your bowling skills off at the same time! Destroy the opposing team with this ball today! By none from Silver Spring MD. This was a gift for a daughter-in-law. She is ecstatic. We offer basic size drilling on this ball for $14.95, but you can also take the ball to your local pro shop for drilling. Hi Nancy. The 6 pounds will be on back order until further notice. how good is this ball or is it good as a spare ball? This is going to be a spare ball. Due to the time it takes to produce the KR Strikeforce Dallas Cowboys NFL Ball ball it will ship in immediately. We cannot ship this ball outside the United States.